- If we do not receive Artwork within 5 business days from order, we will cancel the order with full refund and customer will require to put new order. - There's only one way to get their attention, and that's with custom canvas prints on your walls. - Take it from us, people notice unique, unusual or just one-of-a-kind artwork. And that's what you get when you customize your very own canvas wall prints. 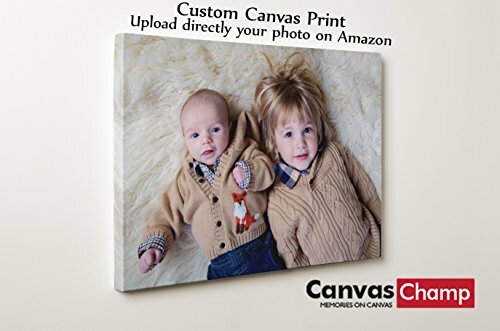 - Canvas printing is the output of image that is printed on canvas material that is stretched or gallery wrapped onto a frame and displayed. - The best way in which canvas printing is used is for the interior designing. - It gives a great complement when it comes in decorating your home and gives you an option of customizing your personal photographs and stock photographs. - Your memories are forever and it will never fade now. - High quality print on cotton canvas wrapped on wooden frame with a 3/4" thickness and mirrored borders. - The brilliant colors are protected with a special UV coating that protects the painting from dirt and scratches. If you have any questions about this product by Canvas Champ, contact us by completing and submitting the form below. If you are looking for a specif part number, please include it with your message. 5x10 matted to 11x14 Nubble Lighthouse Dawn, Cape Neddick, Maine Photograph.